Jeff Smith, creator of Bone and RASL, is releasing his latest comic, Tüki Saves the Humans, online. It's about the first human to leave Africa—and the misadventures that happen along the way. Smith has the full first chapter of Tüki up on his website, and it already shows off so much of the masterful cartooning and easy humor that Smith is so famous for. The comic centers on a human, known to be a "giant killer," who is being led primarily by his stomach. But he encounters an elderly hominid mystic who claims that the fates have something larger in store for our protagonist, something that is hinted at by the end of the chapter. The story is set two million years ago in the grasslands of Africa, and Smith spares no opportunity to illustrate sweeping scenes of the natural world and the animals who are all struggling to survive. 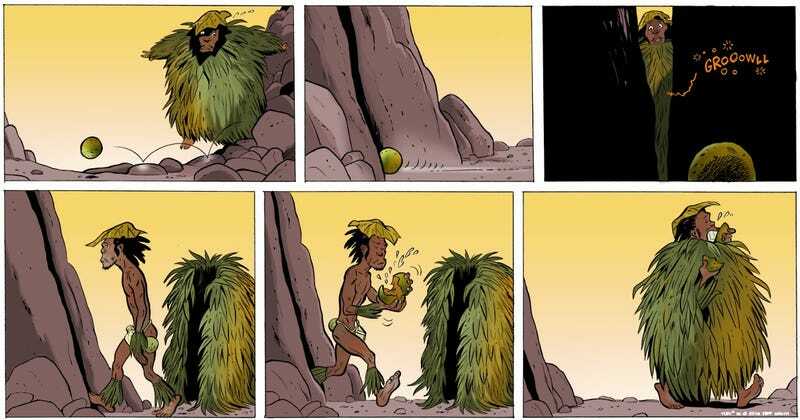 Although this is a comic with touches of magic, it's Smith's attention to nature—in addition to the way he imbues his hominid characters with clear personality in their shapes and movements—that makes Tüki such a visual treat. When Tüki first launched, there were some issues with the interface on Smith's site, which made the comic exceedingly difficult to read. The Beat pointed out this week that those issues have been fixed, so that readers can easily enjoy the comic. The next chapter begins on May 16th.